Let me introduce ourselves. I’m Cindy MacCool and along with my husband, Colm and our son, Jack (18), opened our store in March 2009 in a 150-year-old barn on our 2-acre property in Prince Edward County. We are open from March until November and collect and post items on the website, Instragram, and our Facebook page all winter so keep an eye out even if we're closed. In 2003 Colm, Jack and I left Toronto and made the big move to the country/County. We had a little store in the milk room of the barn in the summer of 2004 then spent 3 ½ years gaining the experience and skills we think make MacCool’s Re-Use great. In September ’08 we made the decision to renovate the barn and reopen the store, which had never strayed far from our minds no matter what we were doing. 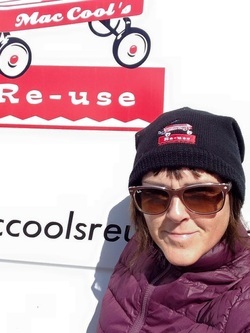 MacCool’s Re-Use is more than a catchy name. Our philosophy involves a respect for the history and quality of an object and giving a new life to previously used furniture. We use reclaimed fixtures and materials for repairs and reconfigurations as well as for the furniture Colm makes. We have a large variety of antiques, collectibles, vintage, mid century modern, and 20th century design furniture as well as 100's of smalls such as West German pottery, art glass, hardware, and funky retro glass sets. Colm is a sculptor and designer and has been busy making furniture out of salvaged materials to sell in the store. Check out "Colm's work." Some of the custom pieces he's made recently include a 7' cherry harvest table, a 6' white ash bench and 2 store counters - 1 for Kokito in Bloomfield, and 1 is mine, in solid cherry. Feel free to email or call if you are interested in anything you see, need more detailed photos, or are looking for anything specific. We deliver just about anywhere or can mail or ship. Enjoy the site and hopefully we’ll see you in the County.